It’s January and, while some of the country is buried in snow, people in more moderate climates are still enjoying the great outdoors (like we are in Southern California). The warm and sunny days still turn into chilly nights, however, making amenities like an outdoor fireplace both desirable and popular. In fact, a good majority of homes here have some form of outdoor fireplace, from fire pits and Chimineas—Mexican-inspired, freestanding fireplaces made in clay, ceramic, and metal—to more extravagant masonry installations. Last summer, my parents decided to jump on the outdoor fireplace bandwagon and had one built. It was my mother who actually designed the “Montana-Dunes” stucco fireplace (pictured above), complete with handpicked “wild horse” stone bricks that she purchased by the pallet from a nearby supplier. It has a tall chimney, stone mantle, and to support logs for burning, it features a grouping of desert-colored fire rocks instead of a standard grate. A large metal Gecko graces the front. My dad did his part, too, adding outdoor lights around the rim of the mantle. When dusk falls, it’s truly stunning. The soft glow of the fire rocks is reminiscent of sitting in front of a beach fire. The fireplace is definitely the focal point of a backyard that also includes a custom-bricked patio, outdoor kitchen, and swimming pool. An outdoor fireplace, like the one my folks built, can be pricey (they paid around $5,000); the more extravagant, the more expensive. But anyone interested in adding an outdoor fire feature in their backyard today can do so easily and affordably. Both Chiminea-style fireplaces and fire pits can be found in a variety of styles and designs from $100 on up. The one shown, right, is from Northern Tools + Equipment and is on sale for $79.99. 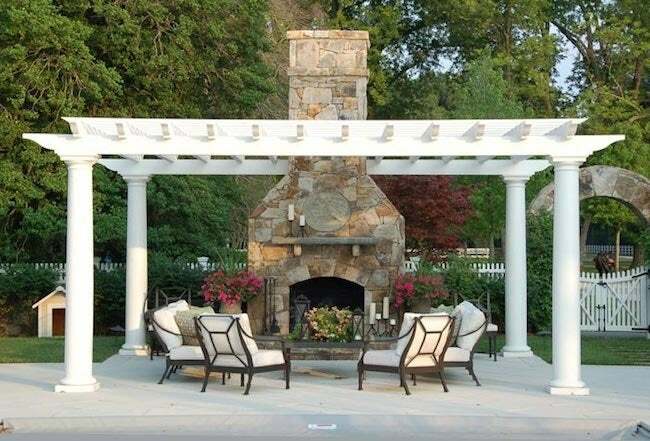 Regardless of whether you install a masonry outdoor fireplace or a standalone unit, be sure to check with your city and county to find out ordinances, codes, permits, and licenses that may apply. Also be sure to check with your homeowner’s insurance company to see if building one would necessitate changes to your policy.